In the field of lifting, CERTEX means certainty. From simple, straight forward hardware and custom-made assemblies, to complete lifting management programs, the name CERTEX represents quality, safety, service and expertise. CERTEX companies are your trusted local source for lifting products and services, backed by world-wide experience and expertise to solve any lifting problem. Wherever people are at work building, producing and moving the world’s goods, CERTEX means certainty. Please Download product and safety information on all of our blocks and sheaves offered for all of your equipment needs. 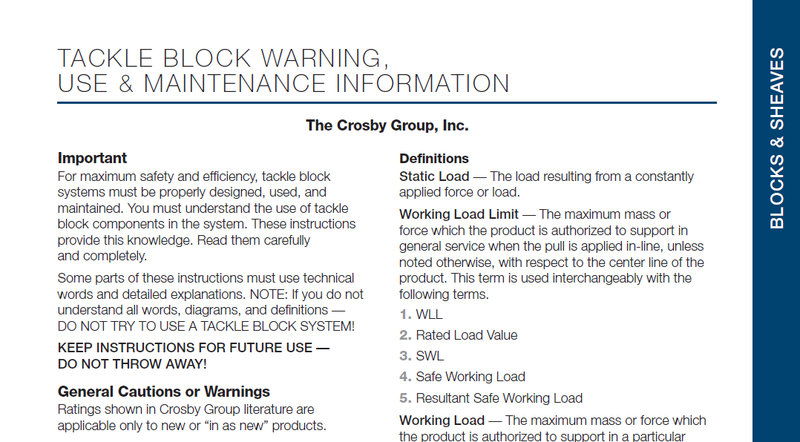 For tackle block warning, use, and maintenance, our PDF offers expansive information. For maximum safety tackle block systems must be properly designed, used and maintained. For high standards in safety, please clearly understand the warning, use, and maintenance use of tackle block components in the system. The working load limit ratings indicate the greatest force or load a product can carry under usual environmental conditions. Shock loading and extraordinary conditions must be taken into account when selecting products for use in a tackle block system. Tackle block maintenance also depends on proper block selection, consideration of shock loads, side loading and other adverse conditions.